The project consists of a double-sided, hand-drawn 8.5" x 11" quarter-fold sheet available to print and distribute freely. 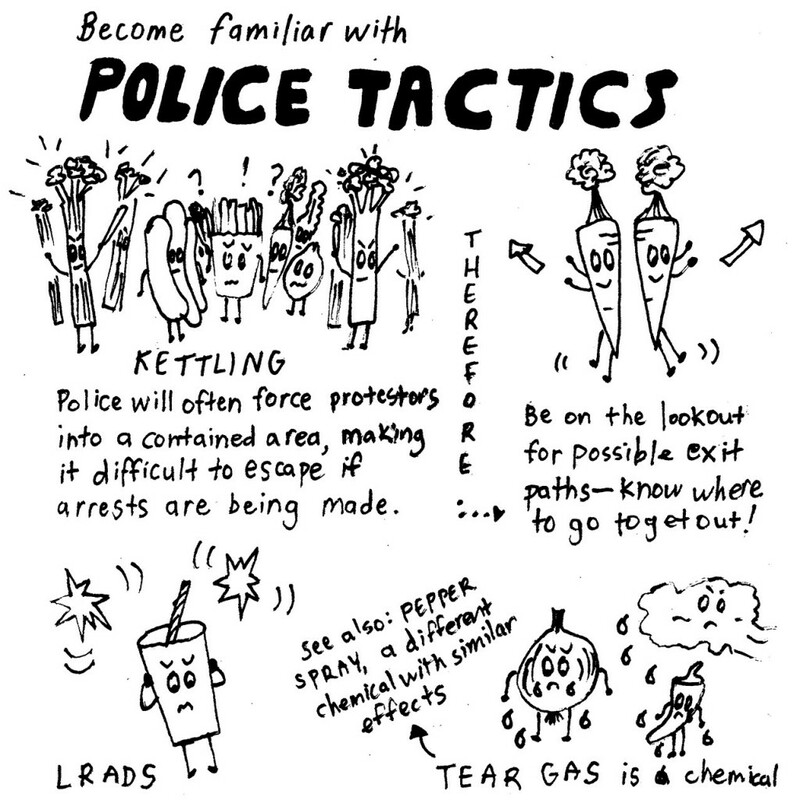 It features such topics as basic information on police tactics (kettling, LRADS, tear gas or pepper spray), ways cops might try to get you to talk to them, and your rights as a student. This guide was created to distribute to high school students walking out of attending protests in January 2017, when an educator expressed concern to the artist that educators contractually could not be seen walking out with students during the General Strike on January 20, 2017. A former high school teacher, the initiator used her knowledge of teenagers to create a guide using humour to engage students while informing them about how to maintain their rights and personal safety, knowing many might be protesting for the first time in their lives. Key players include the following: celery cops, a burrito cussing out a celery cop, and her new favourite youth-oriented 501(c)3, "Cool Youth Org." To inform youth about how to take care of themselves and their peers while protesting; police tactics used to intimidate protestors, and how to deal with them; their rights as student resistors; possible consequences of arrest and how to avoid talking to the police. These guides have been printed and distributed widely by educators in the past couple weeks; a user copied 500 to help students prepare for an upcoming walkout. In addition to educators, parents have also found them helpful. 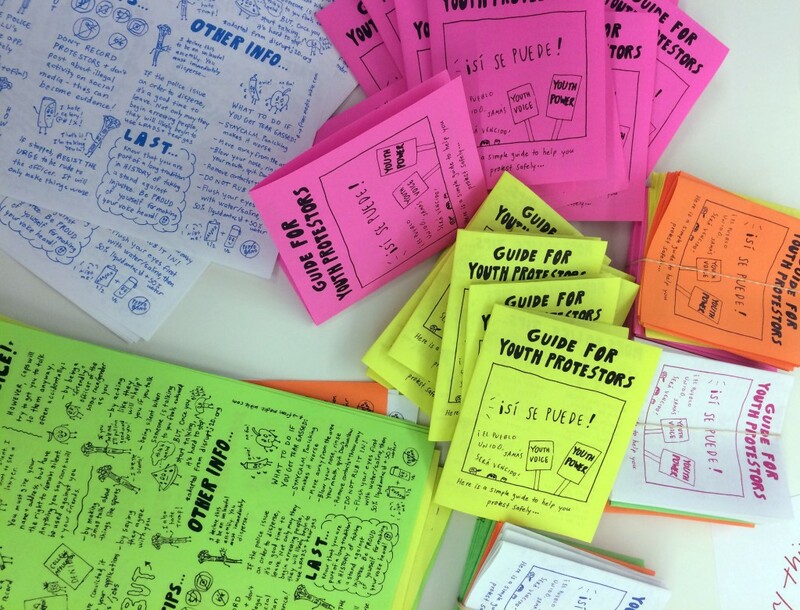 The initiator constantly distributes these guides to youth (particularly unaccompanied minors) and educators during protests. The guide has a secondary benefit of helping youth feel included in protest because they've been giving something made just for them. Empowering youth and helping them see their voice as equally is critical in the struggle for justice. Educators, youth workers, students/young people ranging from around 10-24, parents.